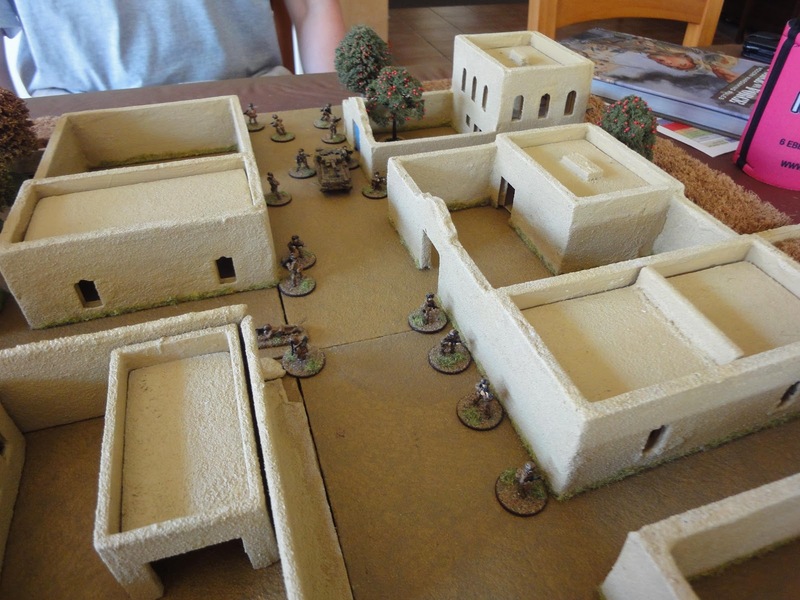 Kevin and I played this one - he took the insurgents, and I took my trusty (and generally unlucky) British infantry. I had 2 sections (4 fireteams) with breaching charges, a JTAC team, an interpreter, and armoured support from a Scimitar light tank. The teams and vehicle were deployed as per the original map, with the exception that I opted to hold my JTAC team off table in overwatch; this turned out to be a mistake, as the highest point the JTAC team could find in the area only allowed them to see the buildings on the east side of the road. My teams knew that they had to move rapidly, as time was against them - the longer they stayed in the area, the more insurgents would be drawn to them. 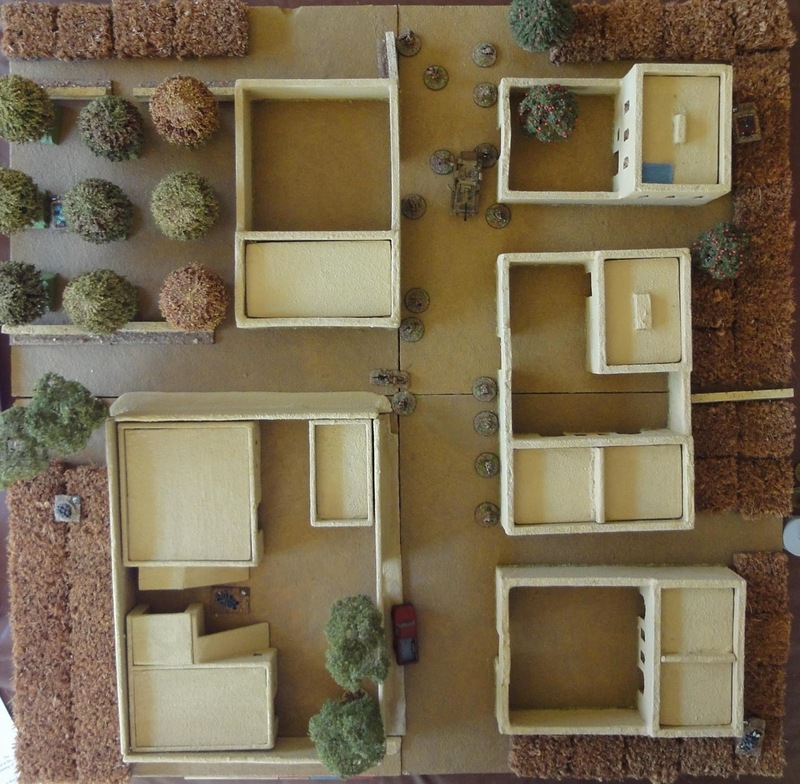 Fireteam 1 started searching the compound in the north-east, which contained a 2 storey building, and quickly found a weapons cache on the ground floor. They wired it for demolition, but still had to search the upper floor first to ensure they had not overlooked anything. Fireteam 2, meanwhile, entered the smaller north-western compound, and began their search, but turned nothing up. There was a brief moment of alarm when they realised that Private Bloggs was missing - he'd managed to fall into the compound's well - but he was retrieved, fortunately unharmed. The large compound at the T-junction was Fireteam 3's target - it also was found to contain nothing, but took valuable time to search. In the meantime, the Scimitar and Fireteam 4 provided overwatch; there was no sign of any insurgents, but the village was ominously quiet. That changed very rapidly when the Scimitar commander decided to move up to the T-junction to get a better view... an RPG team (in ambush on the roof of the large compound in the south west) fired their weapon at the tank, which was struck in the side armour. The Scimitar was destroyed, its crew bailing out - one with minor injuries. As they ran from their burning vehicle, a second insurgent team opened on them from the fields to the east, but fortunately missed. (The insurgents weren't so lucky - an Apache called in by the JTAC team gunned them down). The compound from which the RPG had been launched seemed to be the main base for the insurgents - large numbers swarmed up on to the building roofs to shoot at the British. Fireteams 2 and 3 poured fire into them from their vantage points, and forced them to take cover inside. Bullets were passing in both directions over the heads of Fireteam 4, who decided to take cover in the south-easternmost compound. As they burst through the gates, they ran full-tilt into another insurgent team, who had been waiting in ambush, but had decided to break for tea. Their thirst was the death of them - they were shot at close range, unable to raise their weapons in time. A quick search of the compound by the British frireteam for more insurgents revealed another weapons cache, which was duly destroyed. The British assault the ambush. With darkness rapidly approaching, and large numbers of hostiles defending the last unsearched compound, the British decided to storm in. 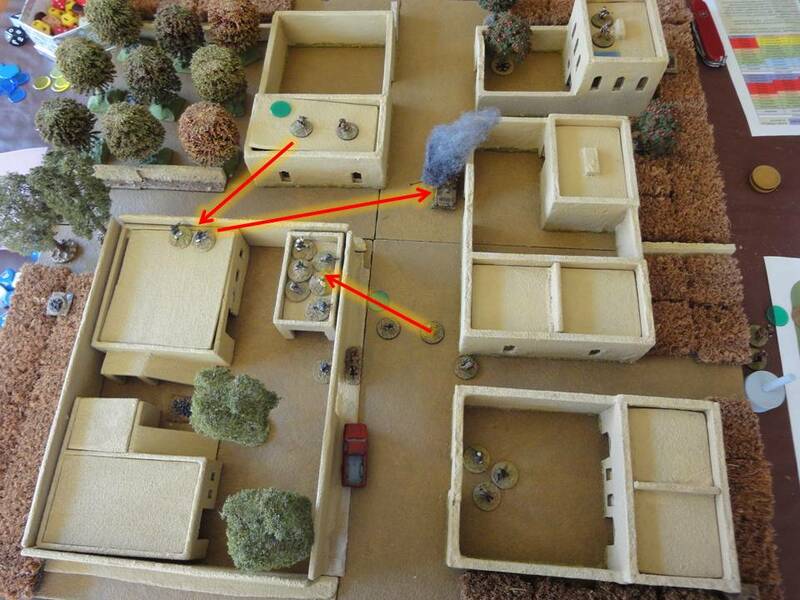 Fireteams 3 and 4 provided overwatch, while Fireteam 1, supported by Fireteam 2, broke into its north-eastern corner using breaching charges; an insurgent team waiting for them to wander through the main gate was taken by surprise, and overcome. This building also doubled as a store for the 107mm rockets - luckily for the Fireteams, the charges did not cause the rockets to also blow-in-place ! The 4th Assault - Notice the immobilized T-55 - Unable to find a target. The aftermath - the lightly wounded Scimitar crew member made a full recovery; Fireteam 1 lost two of its complement - one lightly wounded, and one seriously wounded - both whom were evacuated back to the hospital in Malika City. The Scimitar was 'denied' after being judged to be irrecoverable. We determined that the British had achieved a minor victory - three caches had been neutralised, and five enemy teams had been completely eliminated. But the fourth weapons cache wasn't found until turn 10 ('Curse those dice rolls ! '), not leaving me enough time to destroy it during the game; I'd incurred a serious wound, and lost the Scimitar. (Kevin is getting too good with RPG's against my vehicles !). Another good game, but one that doesn't help Major D. Zaster to quell the insurgency, and reduces the materiel he has available to do so - it's a good job he doesn't know what is in store for him in the not-too-distant future... ! What stood out for me in this mission was the British launched five assaults, and fought close combat four times. The blast entry is definitely advantageous when entering close combat.